Good time to clean out the crisper! Lots of layers and flavor..no meat. Meat is a side dish around here, and often, I am sneaking a meal in with no meat at all. This lasagna is hearty and delicious and no one will say, "Gosh, I wish there had been meat in there!" I promise. I am using jarred pasta sauce, it just didn't justify homemade sauce. This meal needed to be prepped ahead, quick and easy. The day you plan on baking the lasagna, or perhaps a day early is the best for making. I like the herbs and garlic to introduce themselves before baking. It also freezes beautifully, just make sure your baking dish can handle going from freezer to oven. After a side by side taste of skim and whole milk ricotta, whole milk won! Thaw spinach in a colander under running water and squeeze dry. Add the spinach, garlic, eggs and seasoning to the ricotta cheese. Mix well and set aside. The spinach mixture covered by thin sliced zucchini. No cook noodles need lots of sauce! Coat bottom of 8X8 pan with some pasta sauce to cover. 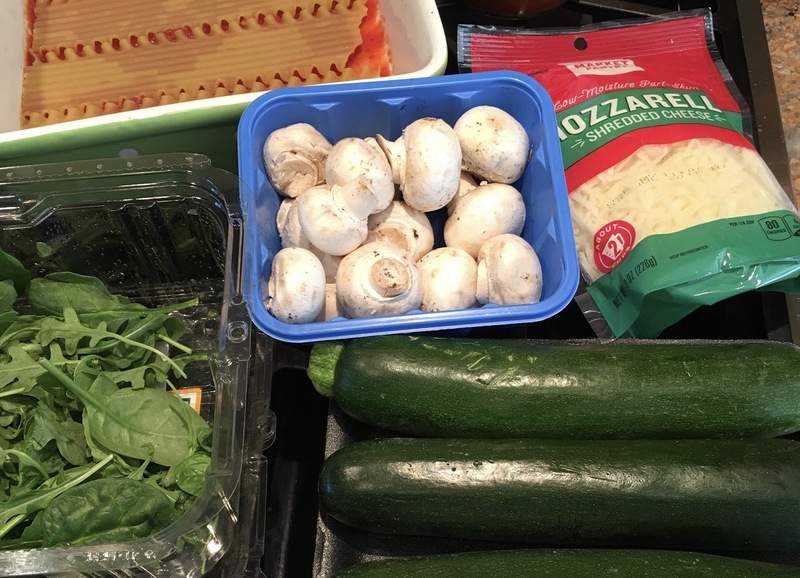 Cover with a layer of noodles, half the ricotta/spinach mixture, half the zucchini, half the mushrooms, 1/2 cup mozzarella, and sauce to cover. Next, another layer of noodles, ricotta/spinach, zucchini, mushrooms, 1/2 cup mozzarella and then top with another layer of noodles. On the top cover with the remaining pasta sauce, the pesto and the remaining mozzarella cheese. The pesto on top adds flavor, aroma and zip! Spray a sheet of foil with nonstick spray, or smear olive oil all over it before covering the lasagna. Can be frozen at this point, or chill until about 2 hours prior to serving time.